Luxurious, beautifully appointed double bedrooms with en-suite bathrooms offer guests every comfort and facility they would expect. Some have bar fridges and all have television, beverage and snack trays. Personal extras in the room are standard. A stunning and secluded cottage is also available. Owned by an ex-caterer who personally prepares and serves the delicious breakfasts, this establishment offers superior service and comfort to those seeking something a little different. In summer the breakfasts are served in the gazebo under the huge trees and on cooler days teas are served in the main lounge. At the end of the day, gather for a relaxing drink in the large English Pub and the experienced can practise their skills on the snooker table. and personal extras, complete the theme. An air conditioner is available to keep you cool in the heat of summer. Touches of lavender sprays, creams and golds are the decorative features of this cosy room. A sunken bathroom with shower has a glass roof to let the sun in all day and the rays of the moon by night! Bar fridge, television, tea/coffee/snack trays are provided. Beautiful view of the garden. Decorated in cool shades of blue and white, this room also has all the personal extras including T.V. A most unusual en-suite bathroom is almost entirely glass - even the basin! One can literally bath under the stars. Almost as big as a house, this wonderfully private and secluded cottage consists of a huge bedroom with a queen size bed and additional sleeper couch for children, a bathroom en suite with full bath and shower, beautifully furnished lounge and diningroom and fully equipped kitchen. You may have breakfast in the main house, or a continental breakfast delivered to the doorstep or self-catering. 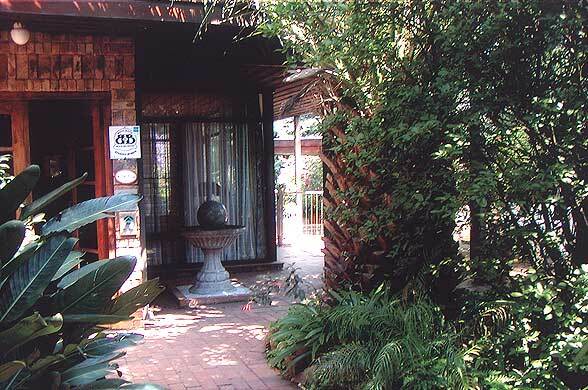 It also has a patio for braais (barbeques), its own satellite dish and video recorder. Own private access to the swimming pool. An air conditioner is available to keep you cool in the heat of summer. A stainless steel/Meranti staircase takes you directly from the carpark to the little balcony with table and chairs. Inside the sliding doors is the stunning suite equipped with its own satellite dish, tea and coffee facilities, mini bar, snack tray and complimentary extras. Spacious cupboards are in the dressingroom area which leads to a full luxurious bathroom with a Meranti vanity and underfloor heating. During summer an air conditioner will keep you beautifully cool. It is very private, quiet and peaceful and has a view over the tree tops. In fact, sitting on the sofa, you can watch birds in their nests feeding their young and eating the Mulberries off the tree! We offer a truly romantic Honeymoon package - starting with candles, chilled champagne and rose petals and moving on to whatever special touches you request! We will make it happen the way you dream of....The Honeymoon package is offered in the Tree Suite, making it beautiful, peaceful and exquisitely romantic.